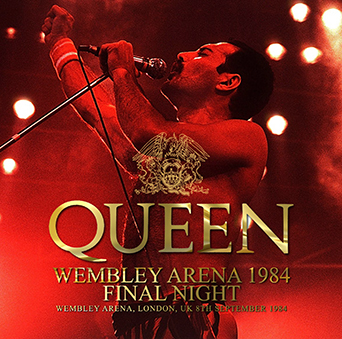 Recorded: Live at Wembley Arena, London, UK 8th September 1984. Comments: From the UK 'The Works Tour' in 1984. 1. Is This The World We Created? QUEEN 1984 returned to load over a blank of about two years. The masterpiece live album which conveys the mother country show that has not been restarted is appearance. It is "September 8, 1984 Wembley performance" that is included in such this work. 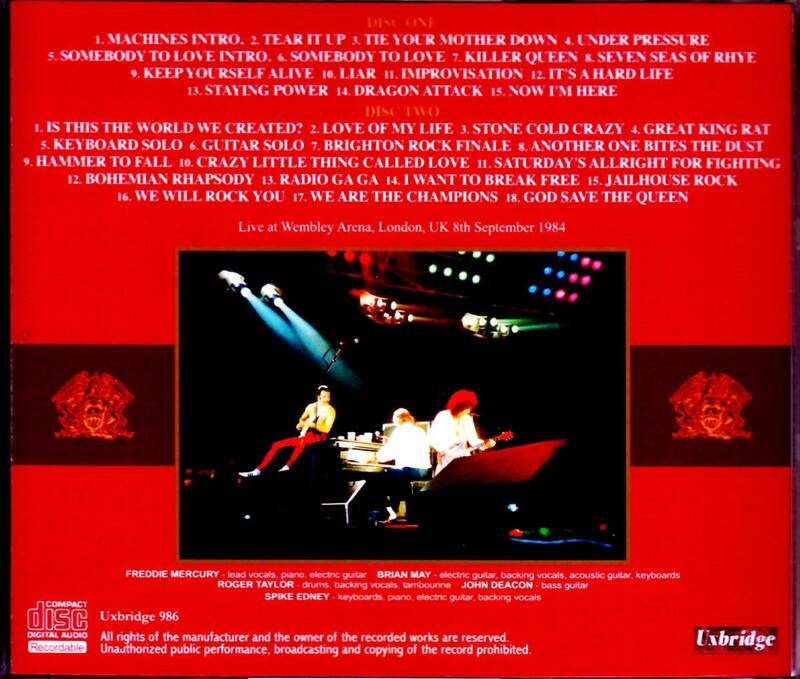 This is a live album at Wembley Arena, not right at Wembley Stadium of “LIVE AID”. By the way, QUEEN stood at the Wembley Stadium for a total of three performances of two performances of "LIVE AID" + "MAGIC TOUR". On the other hand, Wembley Arena has 10 shows, and in particular “THE WORKS TOUR” has 4 consecutive performances. This work is that last night. What kind of position was such a show on the world tour? Let's check from the whole view as usual. "February 27" THE WORKS "sale"
This is the whole picture of "THE WORKS TOUR 1984-1985". The Wembley performance of this work is the final performance of the UK tour with 10 performances. In other words, it was also a concert that was one before that "LIVE AID" for the fans of his native England. This show has been known for a long time, especially in 2006 when a great master excavated. Even in our shop, it was well received as "TRUST IN ONE ANOTHER (part of)". This work is also an upgrade board of that masterpiece. In fact, it is a new excavation master that has the same recording but a longer sound. Although it is slight, a part that has not been released before is recorded at the cut point, and it is as long as 30 seconds after the performance. Moreover, this work is more meticulous mastering such a new master. As a matter of course, the sound was corrected as well, as the pitch was correctly adjusted. Of course, it is not the silent arrow sound pressure earning, but cherishes the natural and neat taste of the original sound, and organizes the sounds for each range. I pulled up the clearness and vividness and brought out the full potential of the original sound. What is drawn with such a sound is a heat performance to tell the fans of the home country return. "THE WORKS TOUR" is an impression that the fatigue gets more and more in the second half, but this UK tour still feels that the engine is taking on more and more than the fatigue in the early stages. Freddie's singing voice is also strong, and you can enjoy the show that plays well. And, the set only in the early stage is delicious. "THE WORKS TOUR" was also characterized by the resurrection of the initial song, but in this work, "Staying Power", "Stone Cold Crazy" and "Great King Rat", which are not performed in the final tour of Japan, are also played. Furthermore, the sense of culmination is strong. None of them were songs up to the "Europe" leg, but there was no revival after that, but "Staying Power" is especially valuable. Although this is not the last performance, it is almost similar to it, the ensemble with Spike Edney also falls into "Dragon Attack" and the arrangement that falls into the snow is also unique to this time. Also, a little interesting is MC before "Love Of My Life". "I'd like to dedicate this song to all the children. Tonight, Roger's son is coming. Tonight's his first concert. He will be a drummer." Say. My son to be a drummer ... Oh, Rufus? I think, actually, Felix Taylor. Rufuss was not yet produced in 1984, and Felix was 4 years old. Brian's prophecy has been slightly off. Recorded in 1984, the new excavation master. Returning to the road for the first time in two years, it is a masterpiece of a live album that vacuum-packed QUEEN which is going to fly out of the world from Britain again. Even though it is the first upgrade in 13 years, it was introduced from the Uxbridge label because it is impossible to assert that this master is the ultimate, but the two-disc set is packed with sounds and performances that are as impressive as it gets pressed. Please enjoy yourself carefully. ★ It has been recorded a little longer than the previous release at the cut point, and it has been recorded especially for about 30 seconds after the final performance.